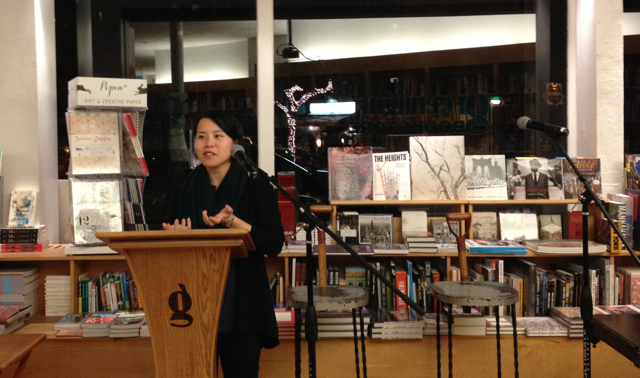 The Chinese-Canadian author Kim Fu read from her debut novel For Today I Am a Boy (January 2014) at Greenlight Bookstore. 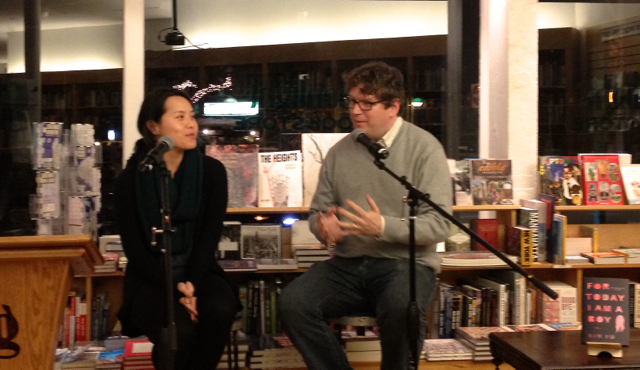 She was joined by Ron Hogan, founder of Beatrice.com, for conversation about the book. For Today I Am a Boy chronicles the struggle faced by the narrator and protagonist, Peter, girl born with the body of a boy. Adding to Peter’s struggle is his immigrant parents’ desire to both assimilate Canadian culture and maintain their family lineage. With three sisters, Peter lacks the brother necessary to divert her father’s intense fascination on raising a son. After Fu reads the prologue of the novel, Hogan begins the discussion by asking about the pressure Peter confronts from her father to be a male, and the desire to have a son. Fu explains that, for Peter’s father, the only way to continue the family lineage is through a son. Even though Peter identifies as feminine, his father pressures him towards masculinity. “The words masculine and feminine are still useful,” she says later in the evening. Though Peter is physically a boy, his identity is squarely feminine. But its not just Peter’s struggle. Her mother sacrifices. The other daughters feel pressure too, all stemming the father’s need to conform as immigrants. Ultimately Peter makes small sacrifices, Fu says. Its about his ability to suffer to prevent disappointment in other people. Hogan points out that the novel avoids the common, happy journey of self discovery often the hallmark of trans literature. Fu explains that as a cisgender writer creating a transgender character, she personally felt immense pressure about avoiding that path. She want to stay clear of what was typical. “Hopefully I muddled it in an authentic way,” she says. When she decided to create the character, Fu says she was fortunate enough to have people in her life that she could ask about certain types of experiences. They directed her towards books, and she read memoirs and scientific papers. Primarily she was looking for the personal experiences to draw on. “The only way to write a real character that feels real is to put that all aside,” she says. While the research provided an important basis for the creation of the character, ultimately it was human experience that Fu needed to create, and that doesn’t come from research. The creation of Peter as a character was partly inspired by Christine Daniels, the L.A. Times sports writer who transitioned at the age of forty-nine. Daniels had struggled as a transgendered individual and then ended up making a very public transition. Daniels ultimately committed suicide. Peter has the benefit of a more private struggle, but must also learn that ever experience is unique. Fu felt anxiety about creating a transgendered character, especially as a cisgendered writer. She now wants to avoid becoming a commentator on trans issues. “The most important thing I can do now is shut up and step back,” she says. Though Peter narrates, the other members of the family play major roles in forming the central idea Fu confronts: the idea of femininity. For all the sisters, they must learn that their world has many expectations of femininity, and accept that they may not fit every norm. For Today I Am a Boy is also a narrative of immigration. These are characters who also exist as outsiders working towards assimilation. Fu, as a Chinese-Canadian, and now, as a Chinese-Canadian-married-to-an-American, is obviously very close to the idea of the immigrant narrative. Hogan asks her about Canadian literature and suggests that there is the perception that it exists in the shadow of American literature. “I don’t feel like it Canadian literature lives in the shadow,” she says. She points to Alice Munro, praising the Nobel winner for her deftly drawn broad strokes in storytelling. Fu compares Munro to a painter who has a canvas with just a few broad lines, but that is a fully formed composition. One of Fu’s concerns though was that her novel would come across as too Canadian, but then suggests that maybe its only too Canadian in the sort of way that Canadians would understand, like a dog whistle only they can here. The setting is an invented town in Ontario, but it captures many of the same feelings of smaller Canadian towns. Fu says too that her identity as a Chinese-Canadian or Chinese-American–she now lives in Seattle–is tied to her Chinese ancestry. Many writers try to distance themselves from their Asian heritage she says, but for her, its part of the way the world sees her, part of how she sees the world, and the two things are inextricable from each other. Fu is eager to get to work in creating a new world, but hopes to better manage some of the anxiety she felt creating a transgendered character. “I wanted to make all the characters exactly like me,” she says, as a way of avoiding that anxiety, but then realized how unnatural it would be, how forced. She concedes she will have to again step out of her comfort zone.